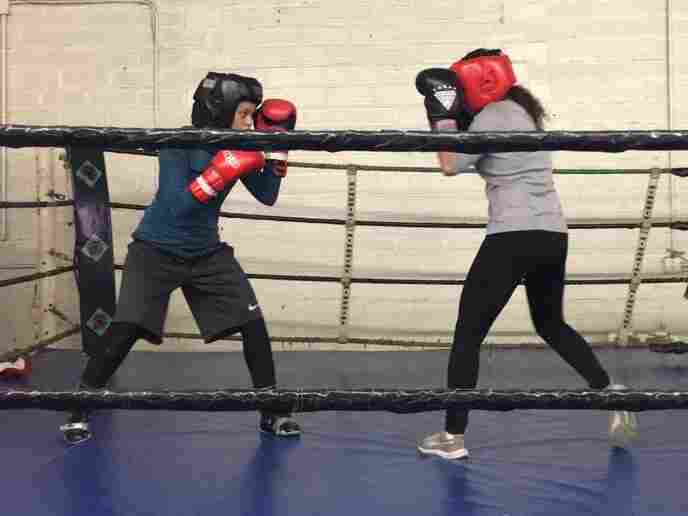 Wearing A Hijab, A Young Muslim Boxer Enters The Ring : The Two-Way After three years of training and a battle with USA Boxing over its uniform policy, Amaiya Zafar will fight in her first competitive bout on Saturday. She says she fell in love with the sport at 13. 16-year-old Amaiya Zafar (left) spars in the Circle of Disclipline gym in Minneapolis earlier this month. USA Boxing has granted Zafar a religious exemption to fight in one bout while wearing hijab. In November, young boxer Amaiya Zafar traveled from Minnesota to Florida to fight her first competitive bout. But before Zafar even had her gloves on, officials called off the fight – they told the 16-year-old she had to remove the hijab she wore or forfeit the match. A devout Muslim, Zafar refused, and her 15-year-old opponent was declared the victor. USA Boxing, the sport's national governing body, has dictated that athletes fight in sleeveless jerseys and shorts no longer than the knee. Zafar adds long sleeves, leggings, and a sporty hijab to the uniform. The organization appears to be shifting its policy, and last week it granted Zafar a religious exemption to compete wearing the hijab so she can fight this weekend in Minneapolis. USA Boxing, in an email to NPR, says it is "in the process of amending our domestic competition rules specifically to accommodate the clothing and grooming mandates of our boxers' religions. ... USA Boxing will consider exemptions on an individual basis per USA Boxing's policy for non-advancing domestic competitions." This weekend will be Zafar's first competitive match, three and a half years after she took up the sport. Her dad had suggested she might enjoy fencing. But Zafar had other ideas. "I would rather get punched in the face than have someone stick swords at me," she told him. "Okay, then box," he replied. At 13, she started working out in her garage, learning the punches, and studying fight videos. And once she set foot in a real boxing gym, she says, "I was like dang, that's it. I'm in love." But it's hard to find girls her age and weight to box. And then there's the uniform issue. "We have 30,000 amateur boxers in the United States," Martino said. "So if you make allowances for one religious group, what if another comes in and says we have a different type of uniform we have to wear? You have to draw a line some place." In this National Geographic video from January, Amaiya Zafar doesn't pull any punches. Zafar said USA Boxing had never given her a reason why she couldn't wear the hijab. She pointed out that in training, male boxers routinely wear long sleeves, pants, and hats as they strive to make weight. She thinks the episode in Florida was one of the reasons USA Boxing granted her the exemption, which is expected to be formally adopted in June. Her opponent in that match, Aliyah Charbonier, thought the forced forfeiture was unfair, and she gave the prize belt to Zafar. "It's not really a distraction for me what she's wearing," Charbonier told The Washington Post. "She still had on gloves and headgear. I felt really bad for her. They didn't give her a chance to fight. ... It wasn't right." "[Charbonier] giving [the belt] to me – it showed that what happened wasn't fair, and we're not going to let it slide, together, as girls in sport," Zafar says. "That really showed USA Boxing that I'm not just some girl that wants to fight one time. I'm in this for real." The 2020 Olympics in Tokyo are three years off, and Zafar has her sights set on competing in the 115-pound category. "I think it's definitely in reach," she says. "There's not a lot of girls that box, especially in my weight class." To get there she would need AIBA, boxing's international governing body, to change its rules to allow the hijab. "I hope that they will, and I think that they don't lose anything," she says. "I feel like they gain something by letting me [compete], because it's making the sport more inclusive." Other governing bodies have recently modified their policies to account for the religious needs of athletes. The Council on American-Islamic Relations, which said in a statement that it welcomed USA Boxing's religious exemption, notes that soccer's FIFA and the International Weightlifting Federation have lifted their bans on religious headgear, including hijabs. "The [international] rule has to change eventually," says Zafar. "Even if I don't get to compete in the next Olympics, I'm still young enough to compete in the one after that, and the one after that. ... I'm only 16, so it's not like my time is almost up. But if I don't get a chance to compete, the little girls that I'm coaching right now — they'll get a chance." So is she ready for her first bout this weekend? "I'm pretty confident," she says. "I've been working for years, so I think I'm as ready as I'll ever be. ... I'm just really excited."